There is now solid evidence that Jupiter’s moon Europa has plumes much like Saturn’s moon Enceladus, meaning the probability of an ocean beneath its surface is very likely. 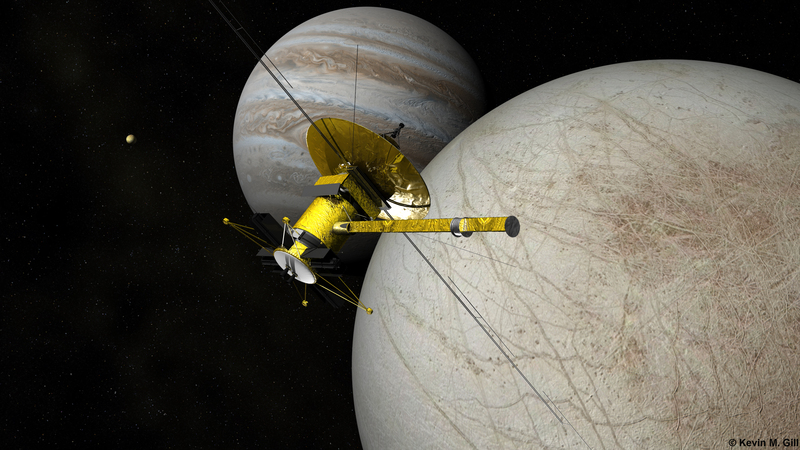 But, it won’t be until NASA’s Europa Clipper arrives that we’ll know for sure. In a news briefing on Thursday, NASA officials explained that there were two repeat occurrences of a single plume on Europa. The first was identified by the Hubble Space Telescope in 2014 and the second, also identified by Hubble, was in 2016. Both plumes were in the same location, which also happened to be the very spot where the Galileo spacecraft detected a thermal hotspot in a close flyby. This information makes the mission to Europa all the more thrilling because if there really is an ocean in the interior, there’s a real possibility of finding alien microbial life swimming around in it. The discovery of plumes on Europa also has NASA discussing the possibility of a probe to Enceladus, which has been found to have a number of icy, geyser-like plumes. This is because Enceladus has such high volumes of hydrogen and carbon dioxide that it could be that there is no life to absorb it. This would also explain why Europa doesn’t have as harsh plume activity. Another hint of life is the smoothing of both moon’s surfaces. Enceladus has large portions of what was once believed to be cratered terrain that has been smoothed over by the vapor. However, most of Enceladus is still covered in craters, leading NASA to believe it is much younger than Europa, which is entirely smooth. To explore the mysterious territory on Europa, the Clipper will be able to tell how thick or thin ice shelves are on the moon, use thermal imaging to see how hot areas are, especially near the plume location, and use an ultraviolet spectrometer, to find more plumes. It will even fly close enough to go through the plumes and take measurements.